We had an anniversary dinner for my parents' 40th anniversary at Buca di Beppo at the Pope table. 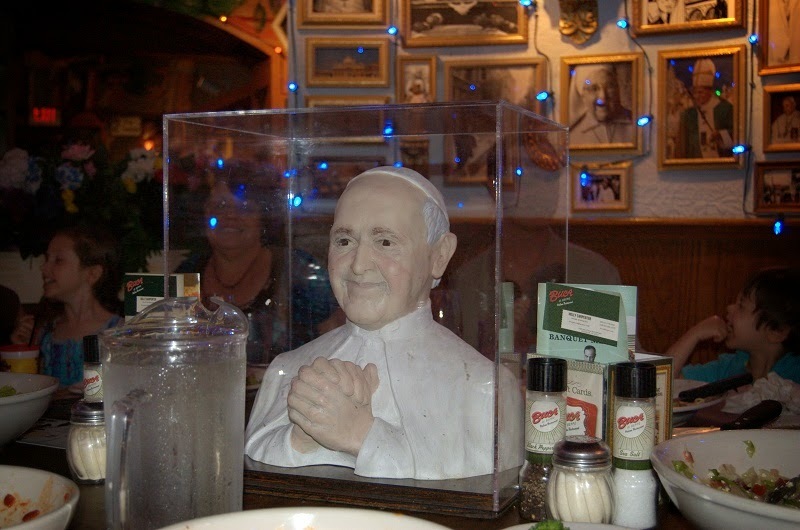 If you are unfamiliar, it is a big table in a room that has a bust of the current pope in the center of the lazy Susan that makes up the middle of the table. I am not sure how educational this is, but there were lots of pictures of Popes and churches so, at least, I was entertained. Right about bedtime, I remembered the girls had school pictures scheduled for Monday. Copious tears from Grace since the shirt she wanted to wear was in the laundry. She went to bed sulking because it wasn't fair. I went downstairs and filled out two sets of paperwork for pictures and wrote two overpriced checks for pictures yet taken that will probably be poor at best. But how do you not buy the school picture? The girls were picked up from school early for doctor appointments. Grace was wearing her preferred shirt that she pulled out of the dirty laundry. They got their physical release forms for cross-country filled out and everyone got a flu shot. Dave says getting a flu shot is apparently the equivalent of getting shot in the leg with an arrow if you are a child. There was much fussing and whining and I got a close up view of how mass hysteria begin. One child would be fine and then another child would moan about how terribly her leg hurt and then the previously fine child would fall to the ground, unable to move due to the terrible pain. I know that shots can hurt and be sore, but this was ridiculous. So all talk of school and educational things took a backseat to discussing the horribleness of flu shots. This is also a banner day: the birthday of the blog! Found out in an email in the morning that tomorrow is Burger King night for Grace's class. I loathe Burger King night. You are expected to spend the evening at Burger King collecting receipts from the customers and the teacher gets a percentage from what is collected. The children have a grand time. They love seeing their classmates out and about and pestering the customers for their receipts. There are many things I'd rather be doing and many things I'd rather be eating. The girls had cross-country practice this afternoon. Lots of cranky children appropriate to their level of tiredness. Olivia had library today and checked out a Magic Tree House book "Hour of the Olympics." Grace had technology class. Insert rant here. Grace is having to do a book report on "Phineas L Macguire Gets Slimed" for reading enrichment. She did not choose this book; it was assigned to her. The enrichment period is supposed to give the students more individualized instruction to help with their weaker areas of reading. Since Grace is fairly advanced for her age, she gets to do book reports. I quail. She doesn't seem to mind yet. They both apparently played a lot of computer games today. Today I read two school emails, two school newletters, one school note about an upcoming fundraiser, one information page about the electronic school record account I need to create, signed two agendas, and discussed with Grace what book of appropriate length she might read for her book log. She is supposed to log 40 books over the course of the school year which means she is choosing books by length instead of worth. Yay. Read "Firefighters to the Rescue" to Sam. He likes it because firefighters. I don't particularly like it because the verse is disjointed and almost rhymes but doesn't and has no consistent meter. It basically sounds ugly. Girl Scout Meeting after school. We are allowing the girls to be Girl Scouts again. Sigh. The sacrifices we make. Last year was a hot mess where the larger troop got caught between warring adults and they split the troop. The year was mostly a loss so I feel somewhat obligated to let the girls try again. Honestly, troop drama aside, I have been less than impressed with the Girl Scouts. I just can't shake the feeling it is all a marketing ruse to get little girls and their families to support the lifestyles of the people in the larger organization. It is all fundraisers and money. And true to form the meeting consisted of filling out paperwork for a new fundraiser. Both girls had PE today. Olivia read "The Snowy Day" by Ezra Jack Keats to herself. I think it was more perusing than actual reading. She also studied apples. Signed two agendas. Avoided looking at the Girl Scout fundraiser packet. Burger King night. Yay. I got to talk to Grace's math teacher who said she was a great math student. The rest of the evening was spent trying to keep Sam from throwing himself in front of a car in the drive-thru. The girls had cross country again. Olivia had library again, but kept the same book since she had just had library on Tuesday. Grace was supposed to have library too, but instead they went to a school wide assembly for another FUNDRAISER! Not much talk today because mastitis snuck up on me. Signed one agenda. A lazy day for me since I stayed home from work. The girls got home from school and started working on Olivia's math homework. Grace would read her the instructions and Olivia would complete the work. They didn't even argue or anything. Overheard: "That's not a box; that's a hexagon." The work consisted of counting and drawing the specified number of whatever. "Philip sees 8 starts in the sky. Finish drawing the stars Philip sees." Olivia gets a monthly homework calendar with work to complete for each day, but it isn't actually due until the end of the month. We boom and bust on the homework which distresses Olivia a little bit. She wants to complete the work on the day it appears on the calendar. Since she cannot work independently yet, doing her homework requires someone to sit there and handhold her through the work. That's awfully hard to do every night somewhere between 7 and 8. Mostly she will do a week's worth of homework in a long sitting and then go another week without touching it. Both girls had art today. I think art is Olivia's favorite class. She drew a lizard. Grace's class did pop art and had to draw a favorite food. Grace chose breakfast and drew pancakes, eggs, sausage, and bacon, but was upset because she forgot the orange juice. 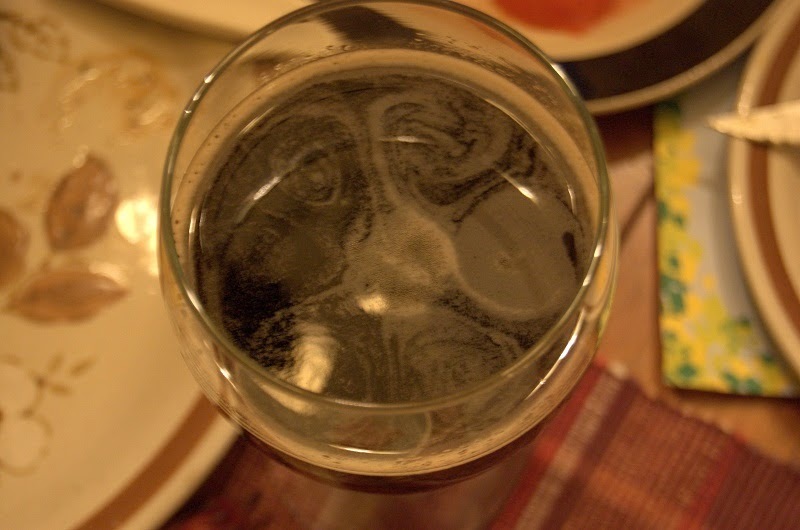 At supper we had an impromptu talk about Fibonacci sequence that was inspired by the spirals swirling in Dave's beer. After supper with an assist from GeekLady, we watched this little movie on the sequence. Signed two agendas and a homework page. Read one note from cross country and am resolutely avoiding looking through the large packet that came home with the latest school fundraiser. Anyone want to buy a magazine? At breakfast this morning, Grace announced she wanted to make cheetah cookies for the parish picnic tomorrow. I said no. Decorating cookies is not on my to-do list. But, in a fit of strange enthusiasm, I told her she could look through the recipe books and pick something that wasn't so complicated. 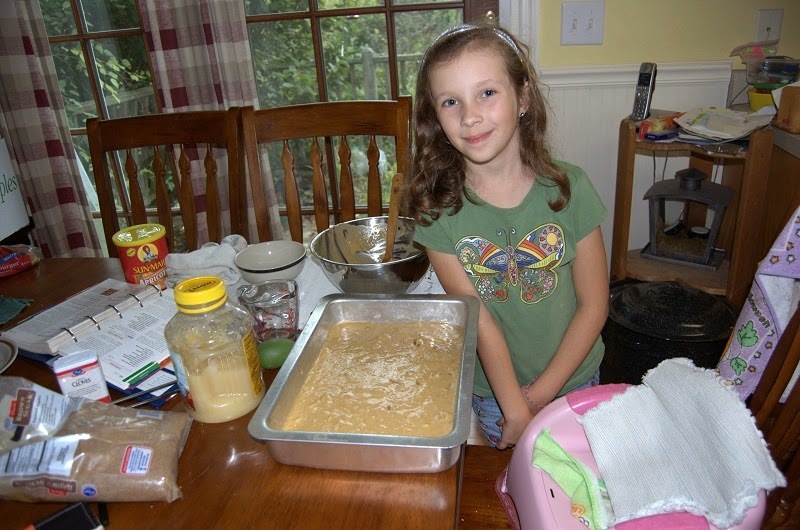 She decided on Apricot Spice Bars. While I showered, she read out the ingredients and Dave told her if we had it in the house. If we didn't, she wrote it on our shopping list. After I was ready to go, we went shopping. Grace and I go to the store with Marian, who screams for nearly the entire visit, and quickly discover that we need a little more information. The recipe calls for cardamon or you can substitute ground cloves. We walk to the spice area and the first jar of cardamon I spy is SIXTEEN DOLLARS! Well. Maybe cloves will work just as well, coming in at a little over $5. Then I spot another jar of cardamon in a different brand for $8. So is it worth the extra three dollars to get the cardamon or will the cloves be fine? What exactly is cardamon? I have no idea, but I know who will. Out comes the cell phone to call my MIL. Graces talks to Grandma to learn the difference between cardamon and cloves. She gets a brief lesson and we are assured that the cloves will be just fine. The rest of the shopping proceeds without incident. When it is time to make the bars, we decide to double the recipe so we have a brief discussion on multiplying and reducing fractions. I am told repeatedly that this is not fraction class. I tell her she has to understand in order to correctly execute the recipe. She acquiesces. After I am sure she understands why 1/4 is 1/8 doubled, we begin assembling the ingredients. She reads out the ingredient and the measure and then doubles it. We take turns measuring out each ingredient. I am impressed with how she uses the scrapping edge on the baking powder to level out her teaspoon. She certainly didn't learn that from me. She also knows how to sift. Cooking with Grandma has paid dividends. We carefully combine everything including two room temperature eggs, taking a minute to examine the texture of the egg whites before lightly beating them. We popped the bars in the oven and then made a glaze to go on top. The recipe called for 2-3 teaspoons of orange juice and a half cup of sifted powdered sugar. I misread the teaspoon and put 2 tablespoons of juice into our powdered sugar. I explained to Grace that since this was just a glaze, the exact measurement didn't really matter and we could just add more powdered sugar until it looked right. The bars baked and now we are waiting for them to cool to try them and see how they turned out. Since I don't do a lot in the kitchen, I am always surprised by how educational cooking is. In other news, a box turtle was found in the yard which was duly stared at and Olivia was eating the seeds of a passionfruit she found in the yard. They learn early what is edible and what is not. Great initial "charge into the fray" start on your blog. Enjoyable and informal and funny. I will buy and ship you cardamom. It is a common ingredient in Indian cooking and is one of the dominant flavours in chai, if you've ever had it. Hey, I could ship you random spices I buy! I have a new hobby! "It basically sounds ugly." My pet peeve in kids' books. A former co-worker of Dom's wrote a book for kids. So we naturally were given a copy. Every time I read it I wonder if she ever read it out loud. It sounds terrible. They assign homework to children who can't work independently? I don't get that. That means really they're assigning homework to parents. Is this an underhanded way to try to get parents to spend more time with their kids? Maybe parents want to spend their few evening hours with their kids doing something else? Though it's wonderful that Grace will sit and do it with her. I love chai. So that's cardamon. I take it that it doesn't cost $16 a jar in the Great North. Oh yes they assign homework! And it *is* homework for the parents. There are times when I look how much they ask us to do at home and I wonder why exactly we are sending them to school if we just have to do it all over again at home every night. Girls and their baking... Julia loves to cook, but she often forgets to clean up, and so I come in and find the counter covered with flour and few egg shells. I can't complain about eating her cookies, though! Oh, cardamom is lovely, especially with apricot. But $16 a jar is really expensive and you won't use all that much. I use it for my Easter bread, and I'm still on my quarter cup jar that I bought for $8 several years ago. She can draw the spots on the finished cookies herself.